High Quality Content by WIKIPEDIA articles! 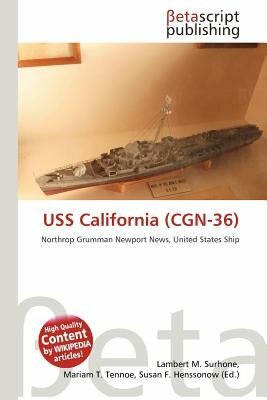 USS California (CGN-36), the lead ship of the California-class of nuclear-powered guided missile cruisers, was the seventh warship of the United States Navy to be named for the State of California. The USS California and her sister ship, the USS South Carolina were equipped with two single-armed Mk 13 launchers, fore and aft, for the Standard Missile, one ASROC missile launcher, and two Mk-141 launchers for the Harpoon missiles. These cruisers were equipped with two 5 inch/54 calibre Mk 45 guns rapid-fire cannons, fore and aft. These two cruisers also had a unique arrangement aft of their superstructures, with a flight deck, complete with a helicopter elevator, and a hangar deck below. Both cruisers also had full suites of anti-submarine warfare equipment. Thus, these warships were designed to combat all threats, in the air, on the surface, and underwater.